We hear sound with both of our ears, obviously. Would one ear be enough to hear sound? Yeah, it would be enough. But huge thanks goes to mother nature for her wits to come up with two ears on our heads because two ears give us the mighty power of binaural hearing, which lets us locate a sound source without seeing it. By the way, we also have binocular vision because we are equipped with two eyes. Sound waves, emitted by a source, reach both of our ears but most likely they won't reach both ears at the same time. The waves' differently timed arrival on the left and right side is picked up by the brain, it recognizes the slight delay between the incoming information left and right, which helps localize the source. Besides the time difference, other key factors for sound localization are level differences and spectral differences at the left and right receptors. We can use this to our advantages in music-making, we can give sounds or instruments specific width and depth, a specific position in a mix, if you will. We can create complex mixes in stereo or surround sound for music and movies using that knowledge. If you work inside a DAW, any DAW, it is very very likely that you have built-in the tools to manipulate timing, level and the spectral information of your sound content to create an exciting stereo image. Let's look at 2 ways to give a sound more stereo width. Think of the stereo width as a panorama ranging from some point on the left to some point on the right. By using a delay (echo) effect which has different time settings for the left and the right side, the position of those signals on those sides becomes more distinct, becomes easy to locate. Signals will be repeated at different times on the left and right side, you will have no problem making them out as non-centric. The separation between left and right is easily traceable, which it weren't at all if the time setting for left and right was identical. But while a ping pong delay (also any automated panning) makes the distinction between left and right easy by constantly switching sides, sometimes we want a sound to play left AND right while sounding wide and basically wider than everything else. Curious ? Please go ahead ! When you have something playing left and right, delay one side by a few milliseconds and you will notice an astounding difference. The more you delay that one side the more it sounds like it gets taken out of the middle and into the very edges of left and right. There might come a point where you delay one side so much that the material stops to make rhythmic sense but you will hear that and I want to invite you to experiment with it. A quickly made effect rack in Ableton Live with two chains, one panned left, one panned right. The left side has a simple delay on it that is set to 15 milliseconds, the right side is untouched. You could switch this around...ooor even make three chains, one for an untouched middle (make it mono with the "Utility" device) and both left and right differently delayed. So what happens here ? By an almost simultaneous, but still slightly delayed, playback of left and right it's easier to separate the two sources and they seem to be much wider apart from each other, their left and right position seems to be as clear as day. Try it out, it's worth it ! If you need a VST plugin for this, there are several work-arounds, for some time I have used Waves InPhase Stereo to manipulate the delay for the left and right side. There is also L8R from Boz Digital Labs, which is very easy to use. ps. Try this out on different material to find out what works best. I like to use it on percussive sounds like loops with transients rather than slow evolving pads for example. ...achieved by doing something what I like to call complementary EQing, you might as well call it mirrored EQing. Granted, there might be another technique out there with the same same name that I don't know of...shame on me ! So the idea is to make the both sides sound slightly different, one side brighter and one side darker. 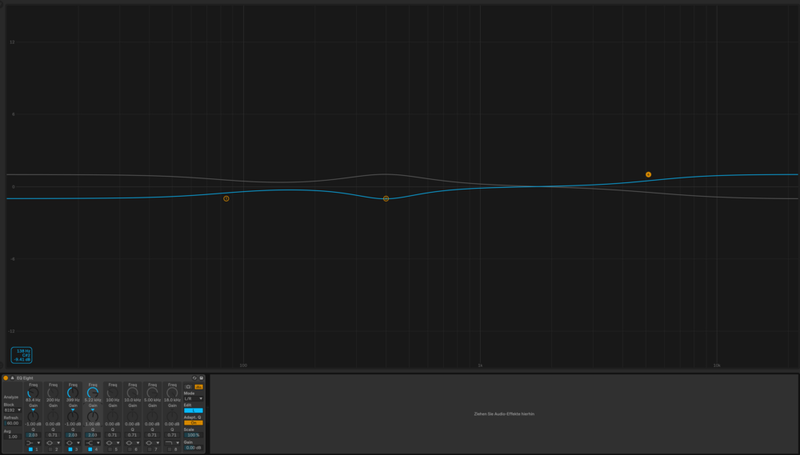 As you can see in the picture, one side (the blue curves) has EQ curves for a slightly brighter sound, and the other side (the grey curves) does the exact opposite. Shaping the spectrum to be different on the left and right side helps distinguish between them, for it simulates how we naturally perceive sound coming from a source. Imagine you are standing outside, listening to a singing bird. Nobody will really think much about how your whole hearing apparatus works but the sound reaches our ears with fine spectral differences, which besides the timing, also plays into our ability to locate a sound source with our ears. Happy holidays and a good new year.